In stock -This product will ship today if ordered within the next 6 hours and 34 minutes. The Konjac Sponge pack is the ideal travelling companion. This duo kit will give you everything you need to stay fresh whilst away from home keeping skin fresh and revived! The Konjac Sponges in this pack contain added French pink clay for tired and devitalised skin. The sponges are perfect after a flight, or exposure to the elements. Both of the konjac sponges in this pack are additive free, help balance pH levels and are suitable for sensitive skin, leaving the skin feeling radiant and rejuvenated. 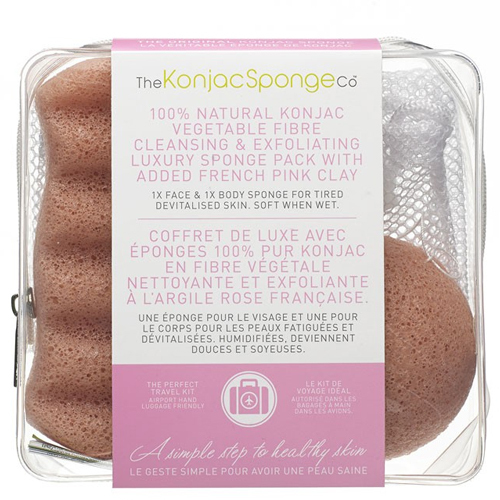 100% Natural Konjac Fibre with added French Pink Clay. Below are reviews of The Konjac Sponge Co Exfoliating Konjac Sponge Pack by bodykind customers. If you have tried this product we'd love to hear what you think so please leave a review.